Dietary fiber, although not a nutrient, is important for the optimal functioning of our bodies. 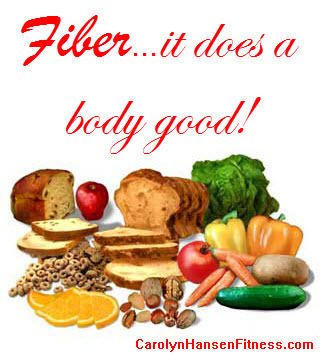 Along with micro and macro nutrients, fiber needs to be an essential part of our daily diets. Dietary fiber (roughage) is the edible part of a plant (fiber only comes from plant based foods) that is not digested or absorbed before reaching the large intestine. Soluble fiber dissolves in water, can be digested and is metabolized by the good bacteria within the gut. Insoluble fiber will not dissolve in water and cannot be digested. It passes through the gut without being digested but helps other foods move through the digestive system easier. Fiber is also categorized as “fermentable or non-fermentable” depending on whether the good bacteria in the gut can make use of it or not. Many foods contain both types of fiber and sometimes soluble and insoluble fiber overlap and insoluble fiber can be used by the healthy bacteria in the intestines. Bacteria like other organisms, require food to eat. They need energy to survive, thrive and function properly. Most carbs, fats and proteins never make it to the large intestine. They are absorbed in the bloodstream so there is nothing left for the “gut flora” (bacteria in your intestines) to get energy from and survive. On the other hand, the body does not have the correct type of enzymes to digest fiber, so fiber is not digested and gets to the large intestine intact and unchanged where gut bacteria can go to work. When the bacteria digests and ferments the fiber, gas is the result and flatulence and stomach discomfort can occur especially if on a high-fiber diet. There are over 500 different species of bacteria living in the intestine. This friendly bacteria or “gut flora” produce nutrients for the body such as short-chain fatty acids that in turn feed the cells within the colon. Weight loss: Certain types of fiber can help with weight loss because they increase the feeling of fullness leading to reduced calorie intake. Fiber is a low glycemic food: Foods containing fiber also have a lower glycemic index. Compared to foods that are low in fiber, lower glycemic index foods cause smaller spikes in blood sugar levels. Lowers Blood Cholesterol levels: Fiber also helps lower blood cholesterol levels by lowering bad cholesterol levels. For the most part, fiber rich food are healthier because they are unprocessed whole foods. If your diet requires more fiber, focus on eating more nuts, seeds, fruits (fresh or dried) and vegetables (whole grains can also be included) but be sure and up your intake gradually otherwise you may feel bloated with flatulence which in turn can cause stomach cramps. According to health officials, the current guidelines for consuming fiber for women to eat 25 grams of fiber daily while men should eat 38 grams. Fiber is an important part of healthy balanced diets. It improves digestive health, helps prevent diabetes, weight gain, heart disease and even some cancers. The equation is simple: To maintain long-term health and prevent diet-related diseases, stick to a healthy balanced diet that is rich in an assortment of nutritious foods and whenever possible buy organic to avoid damaging pesticides and chemicals.